Black Friday and Cyber Monday are great times for buying anything online. This is also a great time to discover new tools that we might have never tried before because they were too expensive. This post is dedicated to some of the top SEO tools offering not-to-miss Black Friday and Cyber Monday discounts. Just a suggestion, you don’t have to buy all the tools; rather, pick 1 or 2 that you will need for a long time or you might need in the months to come. If the discount is solid, then you should buy the tool for 2-3 years because most companies only offer the discount on the first bill. But if there’s an offer on a monthly plan, don’t hesitate to grab that one, too! So without further delay, let’s find out which SEO tools you can get for cheap this Black Friday and Cyber Monday. Accuranker is top notch tool to track your Keyword ranking in Google search and Bing. I have started using them after BrightonSEO and I was blown away by the features. They are not only fastest but they showcase many features like SERP history, on demand ranking update and many more. In the Rank tracker category of SEO tools, they are certainly the top choice as of 2018. They are offering 75% off for the first 3 months (for new customers) and if you are an existing customer, you can upgrade for one year and claim 3 months free. I used the later option which is totally worth it. 2. 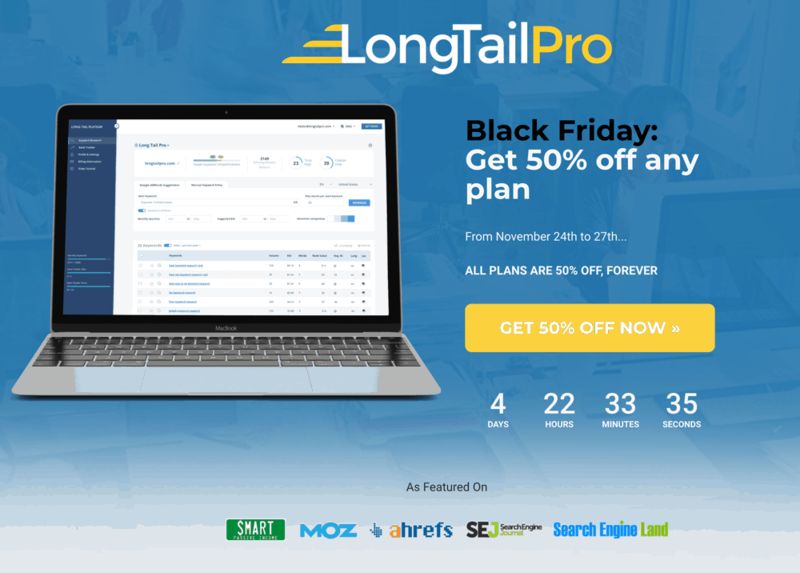 LongTailPro: 50% off on ALL LongTailPro plans – including monthly! LongTailPro is a well-known name in the keyword research industry, as they are popularly used by bloggers, marketers, and SEO agencies for niche site keyword research. From starting as a desktop tool, LTP has transitioned to a cloud-based system and is now more robust than ever. They have also added a Rank Tracker feature that will help you track the ranking of your target keywords in all popular search engines. Currently, they support Bing, Yahoo!, and Google. Mangools is one of our top picks for keyword research and keyword rank tracking tools. I’m a big fan of their intuitive design, and they keep adding new features. 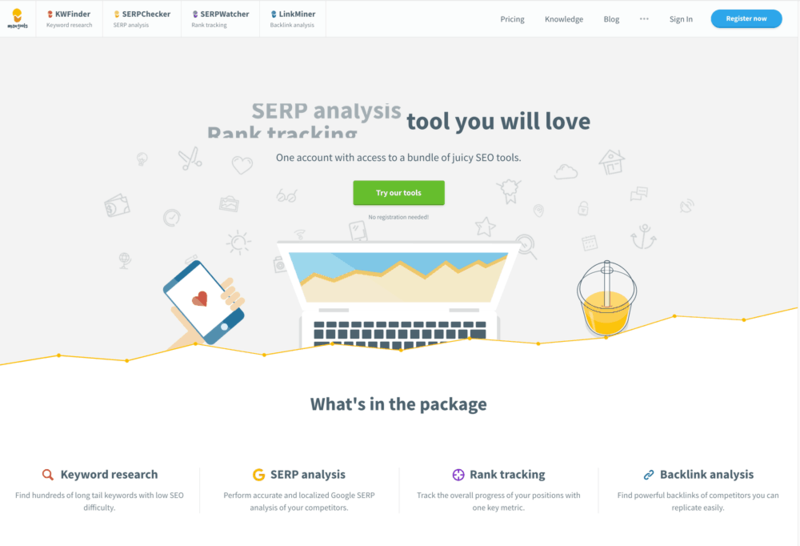 This year, Mangools is offering a 30% lifetime discount when you grab their SEO tools package that consists of KWFinder, SERPChecker, SERPWatcher, and Linkminer. What I love about SEMrush is they keep innovating. This ensures that your website or your client’s website gets the latest and most up-to-date SEO treatment. Unfortunately, this year they are not running any exclusive Black Friday/Cyber Monday deals. However, you can still try SEMrush free for the first 2 weeks. You can use all their features without any restrictions for free for two full weeks (worth $199). If you enjoy the tool, you can become a paid member after the trial period. 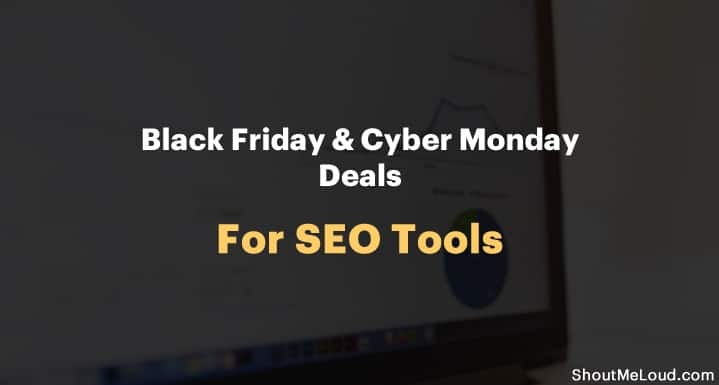 For now, these are the best SEO tools discounts and deals that you can get this Black Friday/Cyber Monday. As I discover more deals which are beneficial for end users like you and me, I will update this list. You can bookmark this post and come back to it as time goes by. As I mentioned earlier, this is the best time of the year to get any online tool that you ever wanted. Be it an SEO tool or a WordPress theme, a hosting plan or a new plugin. Best Black Friday/CyberMonday Deals On WordPress Themes-  Don’t miss it! Do not forget to share these exclusive deals and discounts with your blogger and digital marketer friends. This will help them to save a lot of money!